These Hallway Signs Ship Out the Very Same Day When In-Stock! Place Order before 1pm EST to Received Fast Shipping. Purchase These Hallway Signs from This Reputable Site! These hallway signs are a perfect signage display solution for any business. This wayfinding system is a great way to show simple messages to visitors and guests. 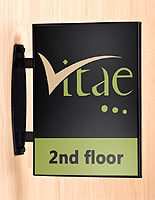 These hallway signs that are double-sided allow users to display printed graphics on both sides. Visitors and guests coming from either direction will be able to see the signage easily. 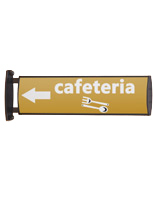 These hallway signs, such as wayfinding displays, can be used to exhibit portrait or landscape style graphics. The frame is designed to accommodate (2) 11-3/8" x 8-1/2" prints. These hallway signs that include non-glare lenses can protect content from getting damaged and ruined. Besides, the plastic overlay also prevents the signage from reflection, which makes it easier for visitors to see the details. These hallway signs that have an elliptical design further emphasize the displayed graphics, making sure your posters get noticed. 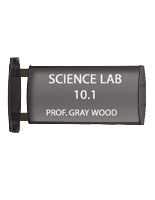 Fabricated from aluminum with plastic end caps, these wall displays can be use for a long time. The sleek black finish also enables the flag signage to easily blend in with any setting. 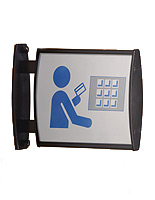 In fact, because the hallway signs have a universal design, users can show a variety of prints and use it in a wide variety of business locations. 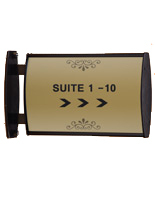 This unit can be used as a wayfinding system in lobbies to display directions. 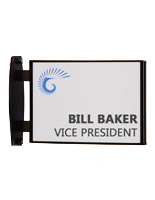 Offices can also use these wall-mount hallway signs to show department names or an occupant's title. Graphics are not be included with the unit. This enables customers to custom made their own artwork to suit particular need or setting. 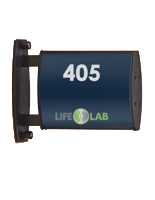 These wayfinding systems, indoor hallway signs come with a suction cup for fast and easy graphic changes. 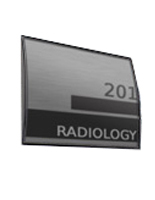 As a result, the signage can be load or remove directly from the front without having to remove the entire unit from the wall or ceiling. These wayfinding systems, hallway signs enable users to make quick changes. Office wall displays, like the one seen here, are available in many different sizes (see right hand corner). Each unit is sold at an affordable price to save buyers money. 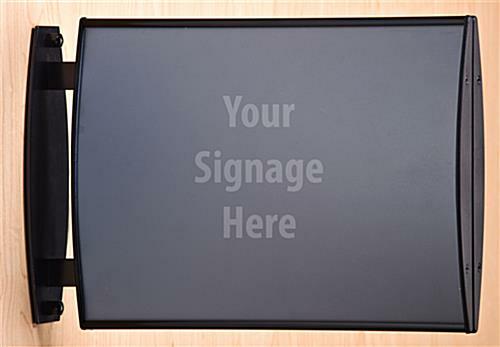 Companies and schools can buy these wayfinding systems in bulk without breaking the budget!